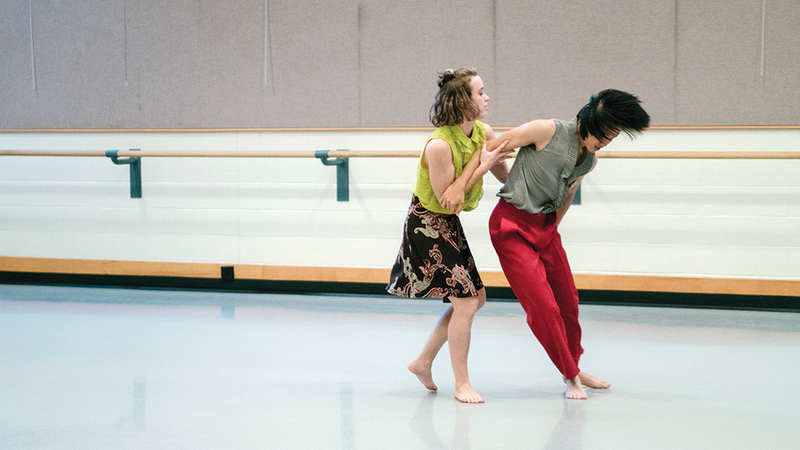 Choreographer Dat Nguyen takes an improvisational approach to creating dance. Will the Sheep Come to Be Cleaned? When an artist's process is intuitive and improvisational, it can be hard to know how to anchor a work in a way that connects its various components. For choreographer Dat Nguyen, that anchor came in the form of a practical necessity: coming up with a name for the show as part of a grant application. "Before I even had the first dance, I was applying for a grant, and I wanted them to know what I was working on," Nguyen says. "In my last show [at the Great Salt Lake Fringe festival], there was a section with a sheep, and one of my dancers was cleaning the sheep. So I just thought, 'I'll name the show Will the Sheep Come to Be Cleaned?' Then the moment I named it, certain emotions came forward, certain ideas came forward. So I could take that into rehearsal and play with it." Playing with ideas and seeing what works has become standard creative practice for Nguyen, a University of Utah MFA candidate and native of Vietnam. But as he recalls his initial introduction to dance, that wasn't always the case. Nguyen says that he didn't even begin dancing until he moved to the United States in 2010, and his introduction to the form led him at first in somewhat conventional directions. "When I started out, I was introduced to ... the kind of dance you can easily find on YouTube: very accessible for everyone, very beautiful," he says. "When I first started choreographing, I would just try to do the most beautiful piece, the most conventional narrative. And just felt like, that's not me." What Nguyen came to understand was that his preferred approach was much more free-flowing, connected to the way he understood how his own mind worked. "Sometimes I'd feel like I couldn't stick to one idea," he says. "I'd see one idea, then a second idea would jump in. I didn't understand it, until I started to do a lot of reflection [about my] anxiety and depression. For me, anxiety is like my mind going 100 miles an hour, jumping from one idea to the next, a lot of emotions layering each other. So that's how I find this collage way of working conveys not just my ideas, but my body experience." Nguyen talks about working with his dancers as a process that starts not with a specific preconceived notion, but instead evolves more from "playing with an idea." The result, at least in the case of Will the Sheep Come to Be Cleaned?, is work that might incorporate everything from modern dance to jazz, from performed monologues to ambient ocean sounds. It's easy to imagine such a combination of elements feeling chaotic, but for Nguyen, the process of unifying a program of this kind can be the biggest creative challenge. "It almost feels like 10 dance pieces by 10 different choreographers," Nguyen acknowledges. "I feel like, the truly creative process is finding transition and stitching them all together. ... If you're doing a visual collage, you might have a bunch of magazines open: 'I like this image, I like this text. But I don't know what emotion, eventually, it will create when I put all these pieces together.' I discuss with my dancers and reflect myself: 'Should this jazz section go first, or in the middle of the show? If it's in the middle, what emotion does that create?' ... The true artistic process is how you organize it to make meaning." Nguyen also recognizes that making that meaning is a process that must take into consideration how the work will play out for an audience, allowing this free-form expression of his own mind to resonate with viewers. "If I just live in my own world, that's too indulgent, and the art will be disconnected from the audience. What's the point of making art if there's no one to share it with?," he says. "And at the same time, if I just skew it to the audience, I'm separating the dancers and myself from something that's personal. So it's all about tension: How much do I give the audience, and how much do I take away from them?" While this specific performance is focused primarily on Nguyen's choreography and his skills as a dancer, Will the Sheep Come to Be Cleaned? reflects Nguyen's talents and interest in a wide variety of creative forms—theater, visual art, photography, music and video among them. "I have this multidimensional personality," he says "If I just choreograph a modern dance show for an hour, that's not me." Still, there's that connective tissue provided by something as simple as giving a work a title—and while that title itself might seem abstract, it provided just the right foundation for Nguyen's wide-ranging creative spirit. "The title is an anchor, because I'm forced to define certain elements, and tie them back together," he says. "So I'm playing with collage, and this improvisation, but if it doesn't fit into this grand scheme of the title, then I didn't use it. I feel there's a lot of tension between where I force things to happen, and where I allow things to come to me."